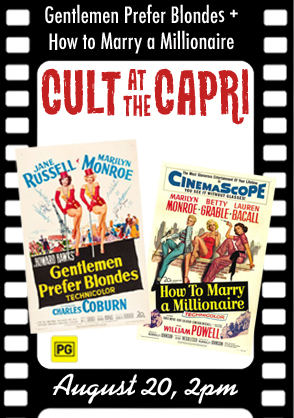 Gentlemen Prefer Blondes and How to Marry a Millionaire – two of Marilyn’s best comedy vehicles, released consecutively in 1953 and featuring strong female casts, gleefully sending up gold-digger tropes – will be screened as a double bill at the Capri Theatre in the Goodwood district of Adelaide, south Australia from 2pm on August 20. “The event, now in its third year, a little less than The Seven Year Itch, attracted 107 participants, and is part of the larger Brighton Jetty Classic ocean swimming events. Marilyn Jetty Swim founder Sarah Tinney, an American, said water conditions were perfect for the event. ‘It was easy, much easier than last year, the conditions weren’t so favourable but that’s a great metaphor for life,’ Ms Tinney said. A lot of preparation goes into playing the part of the Hollywood icon, who was born Norma Jeane Mortensen in 1926. ‘Over the years I think we have perfected it. But the basic plan is women come with their foundation on,’ she said. Ms Tinney said her mother died after an eight-month battle with cancer in 2007 and she made a promise to raise money to find a cure. 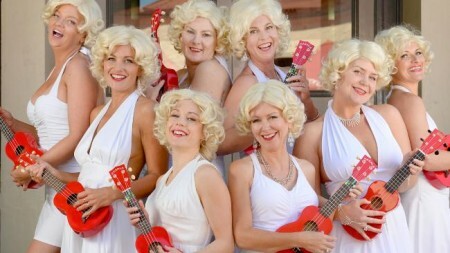 A group of ukulele-playing Marilyn lookalikes from Adelaide, Australia will attempt to break the record for the World’s Largest Ukulele Ensemble in January 2016, reports Adelaide Now. 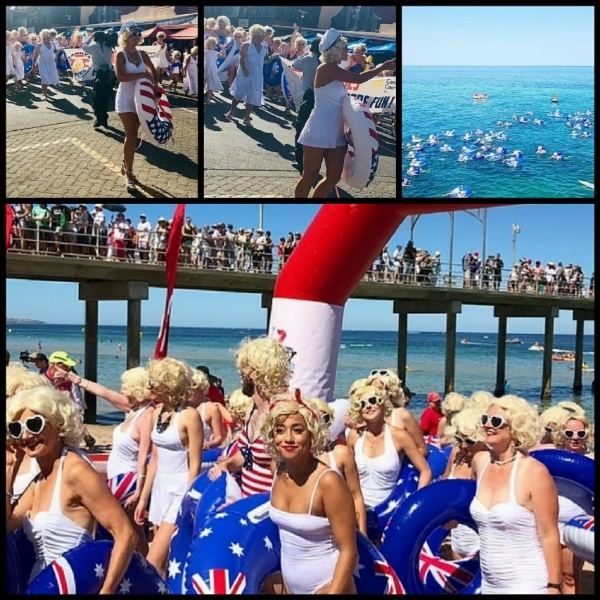 “The nimble fingered ensemble will be led by Mayor David O’Loughlin and the Marilyn Jetty Swim group, a group of Marilyn Monroe impersonators who raise money for Cancer Council SA. 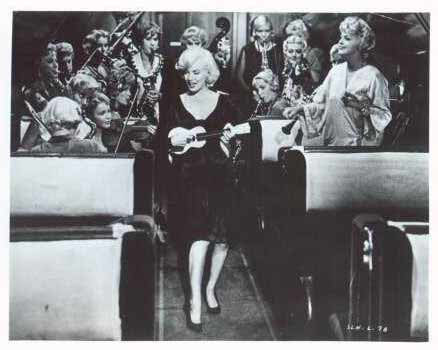 Of course, Sugar Kane – Marilyn’s character in Some Like it Hot – played the ukulele as well as singing in an all-girl band, Sweet Sue’s Society Syncopators. 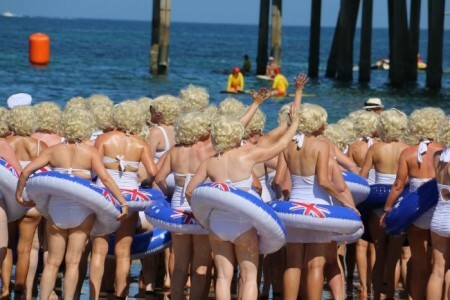 Maybe the Marilyn Jetty Swim Group should copy her 1920s style for the event? Cafe Etc is on Jetty Road, Brighton, a suburb of Adelaide, South Australia. 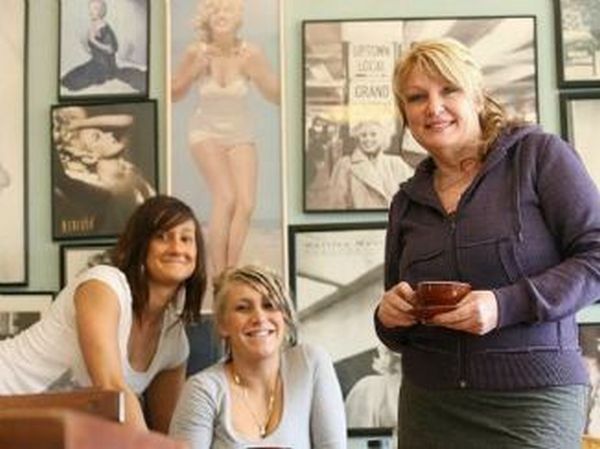 Owned by Carol Walker, the cafe is decorated with MM posters and memorabilia. If you’re in the area, please do pay the cafe a visit and leave a comment here.